The Wildland-Urban Interface (WUI) are areas where homes are built near lands prone to wildland fire. To find out if your home is in a WUI area, you can search your property by Tax Parcel Number or Street Address. If your parcel is listed there, you are in the Wildland-Urban Interface. We recommend that you complete a search by both street address and parcel number. We have determined Very High Severity Zones within the City and has adopted an Ordinance designating them as the City's' Wildland-Urban Interface' as indicated on this map. Keep in mind that as new parcels and addresses are created, they will not immediately be indicated upon these maps or the address and parcel lists. The designations represented in this map apply only to those parcels within the City of San Rafael. U.S. Fire Administration’s PDF Wildfire... Are You Prepared? San Rafael Fire Department's FREE Juniper Chipping and Collection Program! Defensible space is essential to improve your home’s chance of surviving a wildfire. It’s the buffer you create between a building on your property and the grass, trees, shrubs, or any wildland area that surround it. This space is needed to slow or stop the spread of wildfire and it protects your home from catching fire – either from direct flame contact or radiant heat. 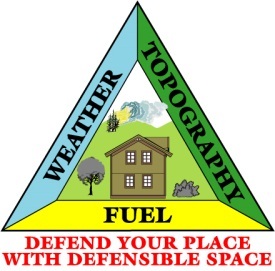 Defensible space is also important for the protection of the firefighters defending your home. Create Fire Safe Landscaping. A fire safe landscape isn't necessarily the same thing as a well-maintained yard. A fire safe landscape uses fire resistant plants that are strategically planted to resist the spread of fire to your home. The good news is, you don't need a lot of money to make your landscape fire safe. And you will find that a fire safe landscape can increase your property value and conserve water while beautifying your home. Choose Fire Resistant Plants and Materials. Create fire-safe zones with stone walls, patios, swimming pools, decks and roadways. How To Plant and Maintain Vegetation. Healthy lawn, ground cover, and perennials form a greenbelt in the home defense zone. Plants that are green and lush give better protection. If regularly watered and maintained to eliminate the accumulation of dry plant litter, these plants will be far less likely to carry fire to your home. While all plants will eventually burn, healthy ones with a high moisture content will be more difficult to ignite. Drip irrigation systems are effective and conserve water because they target where the water goes and control the quantity. Use sprinklers for lawns and ensure that your lawn is getting the right amount of water to keep it green, healthy, and thereby fire resistant. The home defense zone can contain the occasional individual shrub or tree that is located at least 10 feet from the house. By grouping plants of similar height and with similar water requirements, you can create a landscape mosaic that uses water more efficiently and is more likely to slow the spread of fire. Check out FiresafeMARIN, they provide great information to homeowners to help you prepare for fire season. Once a year FireSafe Marin offers Neighborhood Grants for Disposal! $2,000 assistance toward a self-funded Chipper Day. The homeowners make up the difference. Self-funded Chipper Day: Some neighborhoods will divide the cost of a Chipper Day and assess the Chipper participants individually. Other option is to assess the entire association the cost of a Chipper Day. Marin Sanitation Service offers an additional “Green Cart” for a nominal monthly fee. Give them a call at (415) 456-2601.